Finished this little Bubinga and Maple box. I really like the color contrast and the stripes on the lid really tie in the Bubinga sides to the Maple main parts. I lined the inside with suede and added little brass hinges. I think next time I build this design it will have a wood hinge in the ROB COSMAN style. I think this box really lends itself to that type of hinge. I finished it with a satin lacquer and some Bri-Wax. It was a fun project to build and I can’t wait to make more with different wood types. 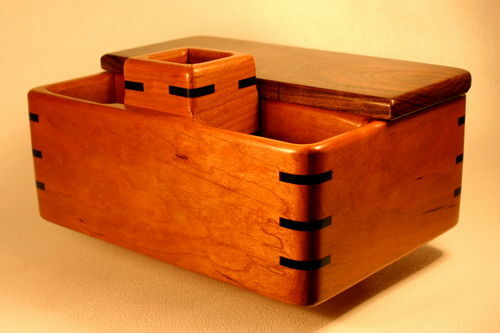 You are correct about the contrast and stripes…beautiful box….well done ! Fantastic! The “box builders” on this site are amazing craftsmen!! Congratulations! You build a very nice box. Great wood combination. Jorge, I like this design. Your photos are top notch…great job there as well. Looks like you tried to make it a pivot and opted for a hinge. The stripes here and on the newer posting are effective visual elements. I see you have some small technical problems here with the routed sides and maybe a corner of the suede fit, but this is real craftsmanship. Your finish looks super, and the total look is pleasing to the eye. This looks like something that would fit easily in the modern art furniture exhibit I saw in LA last year. I think you could have some fun coming up with variations on this general design concept. Hey, have a Plan Check burger for me. Keep boxing and keep posting. Another very nice box, beautiful wood and very nice design…Great job. Thanks for sharing. Boxguy yes originally I was going to try and make it a pivot hinge using a brass rod, but I didn’t have a drill press and I tried with my hand drill and well lets just say it didn’t go so straight so I had to plug the hole with some maple and then I opted for a brass hinge.. This is technically my prototype as it is not for anybody except me and I learned a lot so when I do make these for other they should be perfect (Well as perfect as my current skill lets me get LOL). About the suede its pretty funny because I usually put the suede in after i am done with the box but I thought it would be easier to put the suede it during construction that way its fitter to the bottom inside the dadoes and then I would tape it before finishing. Well the tape pulled the suede up a little and I couldn’t get it all back into the dado. I am looking at variations to this design and will be posting more as go… I’m learning a lot with each box and am sort of addicted to making boxes. The color contrast and the simplicity of the lines are superb, Jorge. Congratulations! Jorge, thanks for the PM and the feedback on your reply above. I have made hundreds of boxes now (yes, I am considering a 12 step program for this mania) and I have learned something from every box. When I install rails along the front and back of the box for my tray to slide on, I now make them wide enough to reach the bottom of the box. I find that If I set them up from the bottom of the box 1/8 of an inch I can put my suede under the rail and move it around a bit before the glue sets. I can usually stretch the ends a bit to get the sides right. That little bit of play in the process helps a lot. You might check here to get some ideas. Tutorials: For methods used to make boxes like those pictured above just click on the blue links below. They are arranged by topic. Jorge, this is a super nice box. Congratulations. Great looking box Jorge. I really like the flow from the inlays into the side pieces and vice versa. Very appealing to look at.